Whatever the audience, he spoke extemporaneously and with such brutal honesty that it was hard not to love the guy. 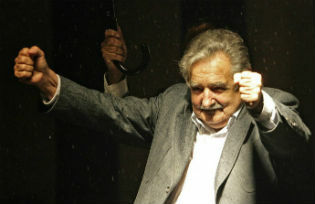 Here are 10 reasons you, too, should love President Mujica. 2. He supported the nation’s groundbreaking legalization of marijuana. “In no part of the world has repression of drug consumption brought results. It’s time to try something different,” Mujica said. So this year, Uruguay became the first country in the world to regulate the legal production, sale, and consumption of marijuana. The law allows individuals to grow a certain amount each year, and the government controls the price of marijuana sold at pharmacies. The law requires consumers, sellers, and distributors to be licensed by the government. Uruguay’s experience aims to take the market away from the ruthless drug traffickers and treat drug addiction as a public health issue. Their experiment will have reverberations worldwide. 5. He supported the legalization of abortion in Uruguay (his predecessor had vetoed the bill). The law is very limited, compared to laws in the United States and Europe. It allows abortions within the first 12 weeks of the pregnancy and requires women to meet with a panel of doctors and social workers on the risks and possible effects of an abortion. But this law is the most liberal abortion law in socially conservative, Catholic Latin America and is clearly a step in the right direction for women’s reproductive rights. 6. He’s an environmentalist trying to limit needless consumption. At the Rio+20 Summit in 2012, he criticized the model of development pushed by affluent societies. “We can almost recycle everything now. If we lived within our means—by being prudent—the 7 billion people in the world could have everything they needed. Global politics should be moving in that direction,” he said. He also recently rejected a joint energy project with Brazil that would have provided his country with cheap coal energy because of his concern for the environment. 7. He has focused on redistributing his nation’s wealth, claiming that his administration has reduced poverty from 37 percent to 11 percent. “Businesses just want to increase their profits; it’s up to the government to make sure they distribute enough of those profits so workers have the money to buy the goods they produce,” he told businessmen at the U.S. Chamber of Commerce. “It’s no mystery—the less poverty, the more commerce. The most important investment we can make is in human resources.” His government’s redistributive policies include setting prices for essential commodities such as milk and providing free computers and education for every child. Mujica’s influence goes far beyond his country of only 3 million people. In a world hungry for alternatives, the innovations that he and his colleagues are championing have put Uruguay on the map as one of the world’s most exciting experiments in creative, progressive governance. Medea Benjamin is cofounder of CODEPINK and Global Exchange. CODEPINK is co-organizing a delegation to Uruguay August 11-17. For more information contact Dale Sorensen from the Task Force on the Americas at geodale1@earthlink.net.